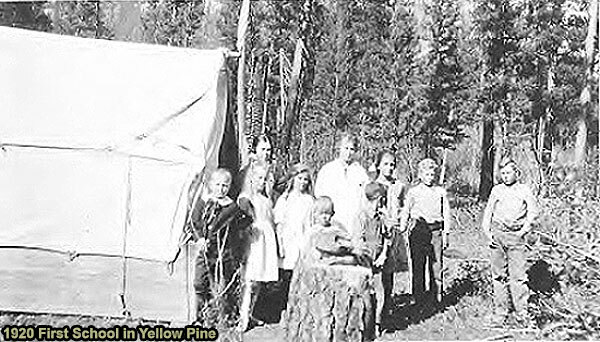 The first school to be held in Yellow Pine was conducted in a tent in the year 1920 by a teacher identified as Miss [Letha] Smith, and who taught a total of eight children. They were identified as George McCoy, Doris Edwards, Leslie McCoy, Verna McCoy, Ted Abstein, Helen Trinler, Myron McCoy and Gil McCoy. A photograph of this group submitted by this writer, also shows the first log school house and the teacher’s cottage … These structures were built in 1922, and the village showed little growth up to that time. 1920-21 – First school was held in a tent, and the teacher was identified as a Miss [Letha] Smith. There were eight children in attendance. They were Doris Edwards, now living in Tacoma, Washington; Ted Abstein from Roseburg, Oregon; a Helen Trinler; and the McCoy children, George, Leslie, Myron, Gil and Verna. 1922 – A log school house and a teacherage were built in the town proper. It has since been torn down, but the teacherage remains as a private residence. 1928-32 The school enrollment was five, and all were boys. Their little teacher, Mrs. Fannie Forscher, now living at Walla Walla, Washington, gained control and respect from each of these boys, after showing each of them her authority. 1936-37 – The third and present school was built of wood frame with one room for the classes and a woodshed included in the building. A large wood heater kept the classroom warm, as the teacher who was also a janitor started her fire at 5:00 a.m.
Harry Withers’ recollections include the story of the Yellow Pine school piano. It had been freighted into Roosevelt during the Thunder Mountain boom. After the slide there, it was freighted back to Cascade by a man named Wayland, whose wife was Valley County’s first school superintendent. In the spring of 1920, he held an auction of items salvaged from Thunder Mountain. Albert Behne must have been on the school board then and bid the piano in. Yellow Pine did not have a schoolhouse then and held school in a tent. Behne hired Johnny Williams to freight the piano into Yellow Pine, and it stayed at the old hotel there until the log schoolhouse was built in 1922. 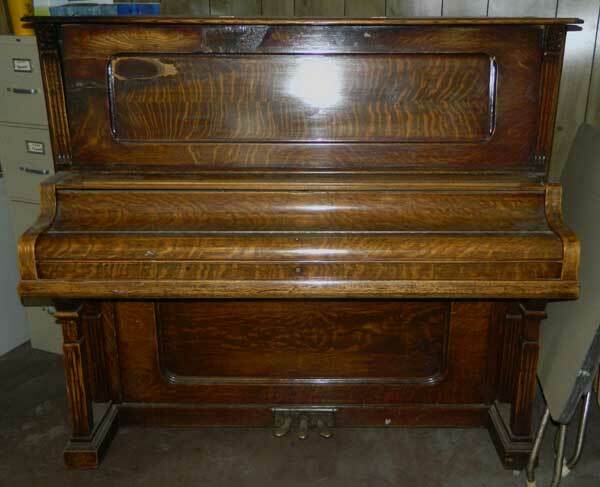 The piano was used at dances and other social gatherings around Yellow Pine. My story is a very small part of some of the happenings that took place in the early days of this area. I am sure that a large number of folks endured hardships more severe than those encountered by my family. But looking back on those times I feel that my folks, Mark and Emma Campbell were a part of those times. As I look back I am sure that my dad was lured to the area by a prospectors dream of the “Gold Mine in the Sky” as there were any number of mining camps and lots of activities in the Yellow Pine area. A lot of this was the aftermath of the gold rush days to the Thunder Mountain area at Roosevelt, which is just beyond the Yellow Pine Mining District. I recall in the early summer of 1921 my dad took me to a carnival that was set up in Emmett, Idaho and after I had ridden the horse on the Merry Go Round we returned to the house to find that a group of ladies were calling on my mother and wishing all good bye for the following day we were to board the train for Cascade. On our arrival in Cascade our belonging were loaded into a freight wagon pulled by two teams and we were headed for Yellow Pine. Our first stop was at Dan Drake’s Lodge at Knox. Knox had become a major stop for miners taking the Thunder Mountain Road into Roosevelt. It was established in 1898 by a Charles C. Randall. In 1917 Daniel G. Drake took up residence and built other structures which included a lodge… as well as stables, barns and other outbuildings. After an over night stay we went on to the Half-Way Station which only had a bunk house of sorts, a stable for the horses and another out building, for the next night out. The following day we went on to Yellow Pine and that summer we lived in a road side shack along Johnson Creek which consisted of one room a cook stove in the corner and a bunk on which we rolled out the bed. The rest of the summer my dad walked into Yellow Pine to work on a cabin that would become our home. He also spent time working on the new school house and teacher’s cottage. Campbell family at their home in YP. Mark (behind chair), Emma (seated), Charles (Scotty) on lap, Donald, standing. May, 1924. That fall my mother and I rode with the mail carrier, a Mr. Henry Abstein who carried mail via a buggy and one horse. Our stop at the Half-Way Station was of course our first night out and in the morning we encountered a snow storm which made the traveling very slow. The only contents of the buggy was our bed roll a trunk and of course the mail. After a very long day we arrived at the Knox Lodge to stay the night. The following day we traveled via truck to Cascade. On our arrival at Cascade we boared [sic] the train for New Plymouth where we stayed with my grand parents for the winter and the summer of 1922. My dad come from Yellow Pine about two weeks later in the season after completing the building projects in Yellow Pine. My brother was born at Fruitland, Idaho on September 25, 1922 and on or about the 20th of October we went back to Yellow Pine via the same means and route that we had come in the fall of 1921. On the way from the Half-Way Station to Yellow Pine the tire came off the wagon and the driver made an exchange for another wagon with a road crew that were working nearby. All the while my mother riding on the seat with the driver she [was] holding my brother a three-week old baby. That winter I attended the Yellow Pine school as a 2nd grader with Mr. Mark Lawton as teacher, I was six years old and it was necessary that I go in order for the school to have five pupils. That winter 1922-1923 – my dad worked for the U.S.F.S. building what was known as the “Hansen Crib”. A structure about 3/8’s of a mile long along the banks of Johnson Creek. It is here noted that the school house is made of logs nicely furnished with beaver board*, good windows and a fine floor. A two room cottage also of logs and finished inside which is furnished with two stoves, one heating one cooking, gas lanterns, a set of dishes and all cooking utensils. The school house is used as a community center and is now in beginning the school term on October 15th with Miss Ida Woosley as teacher with nine pupils. On February 8th 1924 the teacher Miss Ida Woosley became ill and was taken out via the mail carrier and Ray Call and Lorin Wellman. One the return trip a Miss Murphy was brought in to complete the school term. Yellow Pine school & students May 1, 1924. L – R. Back row: Donald Kennedy, George Kennedy, Mrs. Murphy (teacher), Verna Hollan [McCoy], Blanche Willey. Front row: Donald E. Campbell, Myron Hollan [McCoy], George Hollan [McCoy]. School started on September 2, 1924 with seven pupils and I in the 4th grade at age eight. Yellow Pine teacher’s cottage with school behind, 1924 or ’25. Yellow Pine school students, April, 1925. L – R. Donald Campbell, Myron Hollan [McCoy], George Hollan [McCoy], Donald Kennedy, Elizabeth Smythe, Verna Hollan [McCoy], Blanche Willey, George Kennedy. We moved from Yellow Pine in September of 1925 to Cascade where I started to school in the fifth grade with more kids around me than I had ever seen. Photos and story excerpts from the Donald Campbell family collection, courtesy Bob Hood. When I taught school in Yellow Pine, Albert C. Behne, the postmaster, was one of the local school board members, as was Mr. Hanson, who lived up Johnson Creek about 4 miles from the Al Hennessey homestead. The other member, I believe, was Henry T. Abstein, who had a place across the East Fork and who had the contract to carry the mail between Cascade and Yellow Pine on a weekly basis. The young woman who was there the previous year was there only a few days. The Holland [McCoy] boys, Gil and Leslie, wrapped a bear hide around their young brother and opening the door to the school sort of pushed what appeared to be a bear into the school and that was IT for the teacher. So no school till the following year, when I was asked by Mr. Behne if I would give it a try, which I was glad to do. There were five children my first year; and the next, the Reed family, “Dead Shot Reed”, moved to the Basin and that increased the group to a total of thirteen. We studied things relating to the THREE Rs-none of the frills that are taught today, and for the most part, I think it was a successful endeavor for the students. Doris Edwards, who lived in Tacoma, went along after she went back to Tacoma and I think found her days in the Yellow Pine school worthwhile. My stepdaughter, Betty, was a very small child and too young for Grade 1, so I sent her home to stay with Doris, her sister, on that first day. I did a lot of hunting, in and out of season, to keep the larder supplied with meat. Deer were plentiful, of course, and came up from the lower country in April, and Van Meter, with whom I lived, had a salt log across Johnson Creek near the bridge and it was no problem to get meat as needed in early spring. Van Meter was a friend from outside of Mr. Behne’s, and he came two years after Behne to prospect. He was in his 50s in 1921 and was a retired Union Pacific Railroad engineer. He ran freight cars around Pocatello. He was an excellent cribbage player, ski maker, and he called Yellow Pine native trout the “O My” brand, because you couldn’t eat one without saying “O my, that was good”. His log cabin on Johnson Creek on the flat before the rivers meet was long a land mark of note. He is buried in the Pioneer Cemetery. When the yellow school bus rolls past my home in the suburbs of Tacoma, Washington, I often recall the way we made our way to school in Yellow Pine in the winter of 1923; “we” being my cousin, Ted Abstein and I., Doris Edwards. My mother and Ted’s mother, Edna Abstein, were sisters, and for most of the years of my childhood we came to spend the summer months with “Uncle Henry” and “Aunt Edna” Abstein in Yellow Pine at their home across the East Fork, at the top of the alfalfa field. I can still identify the spot on which the house stood by the grove that was in the front yard and the big rock that stood outside the bedroom window. Typical of the way we remember what it was like when we were young, the grove has grown, but the rock has shrunk. In those early years we came to Abstein’s by horseback and wagon, fording the East Fork above the location of the present bridge after the long, tiring, three-day, dusty trip from Cascade. The summers of one’s youth seem an endless stretch of unhurried enjoyment, while those of age flash past into winter. When we left Yellow Pine in September, after gloriously long months of summer freedom, to return outside, it seemed to me I was giving up Paradise to return to city streets and school. But one year I didn’t return. My mother became ill late in the summer and was taken out to the doctor, leaving my younger sister, Betty, and me with the Absteins. Before my mother recovered, we had started school in Yellow Pine, and before she could return for us, snow flew and we were snowbound. Our only touch with the outside was the mail which came once a week by dog team. Uncle Henry had the mail contract, making the round trip to the railroad in Cascade and back, with only a day at home in between. I was starting the sixth grade, along with Verna Holland [McCoy]. (The school was largely Holland [McCoy] and Reed offspring.) Mark Lawton had been persuaded to teach the school for the year. He was newly out of Harvard and had come West from Boston, first for his health and then to look into milling interests for his father. He was an inspired teacher my favorite of all the teachers I ever had. I learned more in the sixth grade in Yellow Pine than any other year of schooling I ever had. He introduced me to Hawthorne and Dickens, and encouraged me to read everything I could find in the tiny community. A good education is “only reading, reading, reading” he told me many times. And, of course, there was plenty of time for reading. I am forever grateful for my year in the Yellow Pine School. School was wonderful, but getting to it was something else. Accustomed to the mild weather of the Coast, just getting out of a warm bed, each morning was agony. Every night I would beg to be allowed to wear my underwear to bed, but that upright Edwardian era would not allow of such decadent conduct. We dressed in front of the stove, and fortified by hot cereal, muffled to the eyes, in boots heavily greased, mittened and stocking-capped, sometimes on snowshoes, we set out for the Basin. The footbridge across the East Fork was a giant pine, felled near the water so that it fell across the river. It was only approximately level and narrower on the south end. It had been levelled [sic] (again approximately) on top to a width of eighteen to twenty-four inches or so. A railing of sapling-size logs gave a hand-hold on one side. No thought, apparently, was given to its being dangerous, and I remember no admonitions from the adults. We were expected to recognize danger for ourselves. We would race down the hill, cross carefully, then rush as fast as the snow permitted to the schoolhouse. Once arrived and our bundled outer layers removed, including boots, we were allowed to spend the first half hour warming our feet on the fender of the heat stove. I can still feel that wonderful, welcome warmth – and recall the smell. Special days came along. On Halloween, led by a few of the older and bolder, we decided to soap the schoolhouse windows. We were deterred by a lack of soap, but candles being plentiful we used candle wax instead. I can attest to the difficulty of removing candle wax, especially with a stem-faced Mr. Lawton standing by while you work. There were Saturday night dances. Everyone came, near and far, and the men danced with the small girls, not treating them as children, but according them the same courtesy and courtliness shown the women. I can still hear “Dardanella” on the scratchy old wind-up phonograph as I circled the floor with Mr. Behne. Finally Christmas, with a special program by the children at the schoolhouse. I am sure we all took part, but I cannot now remember any of the performance. Memorable though were the cakes lined up on top of the piano. What wonderful goodies were turned out on those old cook stoves! Then finally, my birthday. Mrs. Foster baked a very special cake for me – in my piece was a twenty-five cent piece. Mark Lawton wrote a short story about a cougar hunt to commemorate the occasion. What wonderful gifts! Toward Spring, when the first small patch of bare ground appeared on the south slope below our house, I sat there every day watching it grow larger and larger around me, wishing with all my heart for the world to recover and be dirt, rock and plants again. I have never again spent a winter in snow country, but each Spring I recall that patch of brown in the snow. If there is one spot on earth more precious than any other to me, it lies on the south slope of the Abstein place, just next to the alfalfa field. Starting with the name Holland (they never used the name Hollan). Holland is an alias. See, as I understand it, when my grandfather left Montana in a hurry with some units of transportation (that would be horses) that he did not have title to, or bill of sale for those valuable means of transportation he decided that the family would for a short time travel under the name of “Holland” until the other gentlemen with the rope and legal title to those horses gave up the search. After that the boys seemed to like to alternate names whenever they were about to do something questionable, at least that is the family lore. My dad used to get a sheepish grin on his face anytime anyone happened to mention the Holland brothers. 1st dog team for Cox’s in 1928. Lafe drove this team to school. That fall  Lafe stayed with Mr. Behne (pronounced Bee-nee), the founder of Yellow Pine, so he could attend school. Lafe developed great respect for this gentleman. Mr. Behne was a well educated man who had been a telegraph operator. He said he came from the East, but otherwise rarely talked of his past. He did a great deal of reading, especially the New York Times, to which he subscribed. He looked forward to the papers coming each week on the dog team mail deliveries. I remember Lafe saying the Time was the most important part of his mail. Mr. Behne was a lot of help to Lafe. At night, Mr. Behne would go down to Homer and Sadie Levander’s place to listen to the “Amos and Andy” show on the only radio in Yellow Pine. He always asked Lafe to go with him to guide him back to his shack, as his eyesight was poor. He wore really thick glasses. Another bachelor, Charlie Shaddock, stayed at Mr. Behne’s. They shared the same interests and were both such gentlemen. Lafe’s first teacher was Mrs. Dixie Hopkins. The student body was made up of Lafe and the Reed children from the South Fork of the Salmon. The Reed children and their mother stayed at the Abstein place east of town that winter. Each day the children walked over a mile and a half to school. Lafe says he can still see those girls walking through the snow, their long dresses dragging with the buildup of ice and snow on the hems of their skirts. The teacher’s cottage was next to the store and the school house south of that. All the buildings were of logs until later years. The Yellow Pine School has a colorful history. When Lafe began attending in 1928, there had been a school in the community for eight years. The first Yellow Pine school was in a tent in 1920. Eight students were in attendance. In 1922 a log school house and a teacherage were built in the town proper. This was the school Lafe attended. It has since been torn down, but the teacherage remains as a private residence. In 1936 a new one-room school was built with a woodshed adjoining. In a later year when the wood stove heater was abolished and oil heat installed, the woodshed was improved and became a recreation room. Our daughters both attended this school. For many years a little brass bell was used to call students to class. It could be heard at quite a distance. One day one of the pupils decided to take the clapper out of the bell to annoy their teacher and to give the children a longer noon hour. As Lafe relates, it was not a smart thing to do. In those days punishment was very effective since the teachers started from the bottom side up! Misdeeds were punished twice, for pupils who vexed the teacher received a second punishment when they returned home. From that day on, a horse bell took the place of the loud little brass bell. The piano at the school came from Jake and Eric Jensen’s saloon at Roosevelt town. Many are the stories about this piano, which went through a fire and then the flood that drowned the town of Roosevelt. When it arrived in Yellow Pine it was used at the school but was available for dances and other social gatherings. As the only piano in town it seems to have been part of the Public Domain. For a while it was moved up to the old hotel on the hill. In 1929, when the Coxes celebrated the grand opening of the lodge at their new dude ranch, they hauled the piano there for the musicians to play. This same piano is used in the school at Yellow Pine today. Some of the ivory is missing from the keys, showing evidence of the piano having been in a fire and a flood. It has been tuned a few times, but badly needs it again. Lafe had missed a couple of years of school due to his health problems and during the move from Sweet. In 1929 his teacher was Mrs. Fannie Forcher. She had a son in the upper grades and another boy who was company for her son. She also had a little daughter about four years of age. That year the school had five boys – the two McCoy boys, the teacher’s boys and Lafe. The little girl was taught kindergarten. Lafe says Mrs. Forcher was the best teacher he ever had, even though she was very strict. An excellent candy maker, she enjoyed putting on taffy pulls for the children and the community. She kept a goat in order that she and the children would always have fresh milk. In the fall she had hay delivered to last all winter. Mrs. Forcher taught at Yellow Pine for quite a few years. Her students built ice sculptures from snow and water, just as artists do today at the McCall, Idaho, Winter Snow Carnival. The pupils built igloos and animals. One year they built a large horse. In the picture, Mrs. Forcher’s little daughter is sitting on top of the horse. Ice sculpture made in schoolyard in 1928 by teacher Fannie Forcher and the pupils. Mrs. Forcher’s daughter Dorothy on top of the horse. The next year quite a few children attended school. One afternoon, all were deeply involved in their studies when they heard a big explosion. Mrs. Forcher looked out the door and saw either smoke or steam coming out of the roof of Bill Bayse’s house. The boys in school and others from the community went rushing to see what had happened. Bill’s still had blown up on his cook stove! He’d had a batch of peach nectar in the making. He had a good seal on it but the coils got plugged with dried fruit. At the moment of the explosion, Bill was outside gathering more wood to stoke up the fire. That saved him from being badly burned by the steam. The incident created a lot of excitement for the school children. Note: On the old timer’s tape, Lafe can be heard telling the story of the still blowing up, adding that school was let out so the kids could go help find the pieces and parts, earning a nickel. Yellow Pine school is located in the village of Yellow Pine, 65 miles east of Cascade. This mountain community has had a school since 1920 and today still has a few students. The first school was held in a tent with eight students and a teacher only remembered as Miss Smith. Then a log building was built and used as school. In 1928 there were five students, all boys, and a teacher by the name of Mrs. Fannie Forscher. The building used today is the third school in Yellow Pine. It was built in 1936. The most students in one year, was 27 in 1941-42. Teachers who have taught in Yellow Pine are Miss Smith, Mark Lawton, Dixie Hopkins, Fannie Forscher, Alice Johnson, Virginia Dougherty, Lucile Parson, Elsie McKensie, Flora Perron, Allen Fritchle, Arthur Purnell, Geneva Quary, Ellen Ikola, Eilene Blackwell (Evans), Anna M. Hughes, Bertha White, Mrs. Brainard, Mrs. Inman, Bessie Williams, Fannie Roark, Mrs. Emma Bryant, Joseph A. Giroux, Oda Wren, Hazel Scheline, Mary Scholes, Pat Inama, Vernon Olson, Dave Imel, Jack Quast, Jaci Cochran, Jeff Fee, Richard Millar, William Erickson, Patty Schindeldecker, John Hansen and Lynn Imel. In 1974 the teacher was Richard Miller, and he decided the Yellow Pine school needed a bell. Being a former navy man he decided to get a ships bell for the school, if possible. Some how he got the bell from the U S S Carson City. They had a big get together with Senator Frank Church, Representative Steve Symms, two navy officers and school board members from McCall to dedicate this bell to the Yellow Pine school. This was May 25, 1974. In the early 1990s it seems that Carson City, Nevada wanted the bell because it was named after their city. They said it should have been theirs in the first place. After much letter writing back and forth with every-body involved it was decided to give the bell to Carson City. Another navy ship’s bell was offered in the trade. On August 20, 1992, a representative from Yellow Pine presented the bell to the Mayor of Carson City, in Carson City. The trip was paid for by Carson City, NV. The school in Yellow Pine has a school bell and the U S S Carson City Bell, is now owned by its namesake. Note: The year after Mr. Petersen published this book, the Yellow Pine School closed for lack of students. The last teacher was Ms. Linda (Murphy Vipperman) Kildow 1992-2001. It currently houses the Yellow Pine Museum. This entry was posted in Weekly History on March 17, 2019 by The Yellow Pine Times.